Gone are the days when mudrooms were forgotten spaces filled with shoes and coats. Today’s mudrooms are a major focal point of most homes. Fortunately, mom’s everywhere can finally rejoice. 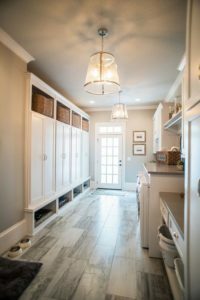 The team at Miya Interiors have uncovered our hacks to mudroom designs. 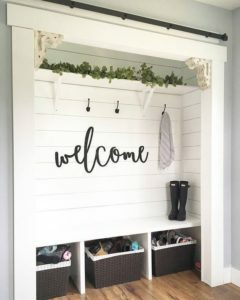 These tricks will help you get you well on your way to having the fun and functional mudroom of your motherly dreams. Just as kitchens have designated areas for prep and cook, so should your mudroom. Think of separate areas for storing jackets, coats, and bags, along with shoe storage. This is your “go-to” area and should be located near the exterior door. Depending on your needs, you can also have a space for dirty clothes and laundry. If your laundry room is nearby, consider putting this dirty laundry area near there. You can even have a pet area for food and supply storage. Take a look at this perfectly organized mudroom featured on The Home Bunch. Don’t overcomplicate your mudroom. Most mudrooms become messy if it’s overly complicated. Make it simple for your children to follow, and they’re more likely to keep it organized. The simpler your design, the better off you’ll be in the long run. We like to keep our palette clean and fresh so that our clients are motivated to keep the space clean and fresh later on. We love this small and simple design by The Schmidt Home featured on Lela Burris. Mudrooms are all about organization. The more storage space you have in your design, the more organized you’ll be. Following the zones, you can add the needed storage space accordingly. Some of the tools we use for our clients? Check out this modern mudroom designed by Studio McGee. 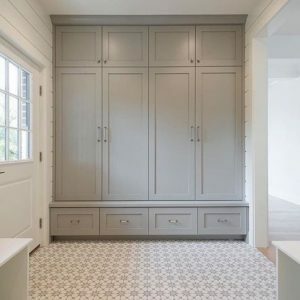 Clients often ask us which flooring we like to use in mudroom designs. While we love the look and feel of wood floors, we continually opt for tiling. Tiling cleans easy and can handle all of the debris and water coming in off the streets. Luckily, there are hundreds of tiling options to choose from, including everything from unique patterns to laminate wood floors. Take a look at the tile used in this design. If you’re about to put on your shoes, don’t you want a place to do it? A cute bench in your mudroom area is the perfect addition that every mudroom owner needs but often forgets. Whether you opt for a stand-alone bench or a built-in seating area, we suggest adding something that’s big enough for a couple of people to sit at once. 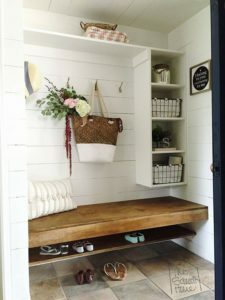 We love this custom wood mudroom bench from Décor Pad. For additional help designing your mudroom, contact the Miya Interiors Interior Design team today.